Franz Josef Land (Земля Франца-Иосифа) is an archipelago in the Arctic Ocean, and administratively part of Arkhangelsk Oblast, Russia. About 300 km east of Svalbard and 400 km north of Novaya Zemlya, Franz Josef is one of the remotest parts of the world. It's made up of 191 uninhabited islands, 85% of which are entirely covered by ice. It was named for the Austrian Emperor who ruled from 1848 to his death in 1916 and was the destination of the only major Austrian Arctic expedition. July is the best month to go, being one of only two months when the daily mean temperature passes freezing. There is a 80.7984247.5628971 Military Base on Alexandra Island. The archipelago is a military area and you will need a special permit to enter. 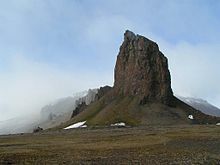 Since 2012 it has been part of the Russian Arctic National Park. For about three-fourths of the year, the sea is covered by ice. During the winter part of this period, it would probably be possible to land a helicopter on that ice, as it would be thick enough. In the summer, however, the ice can melt. There are no restaurants on Franz Josef Land. For water, you could perhaps boil the glacial ice found on every major island in the archipelago. Remember, though, this is a national park. You will probably need to camp in the area, which will mean enduring bitterly cold weather unless you're going in July. Bring plenty of food wherever you go, and make sure that you do not go to the islands when ice freezes or unfreezes. Also, it is best to plan your route before you go and bring a map - that way, it's hard to get lost. If Franz Josef Land is not quite far north enough, there's always the North Pole. For a more populated Arctic experience, you can visit Longyearbyen. Tundra conditions, which are slightly more habitable than Franz Josef Land, are located in Greenland, northern Canada, Alaska, and Siberia. This city travel guide to Franz Josef Land is a usable article. It has information on how to get there and on restaurants and hotels. An adventurous person could use this article, but please feel free to improve it by editing the page. This travel guide page was last edited at 17:38, on 25 August 2018 by Wikivoyage user Traveler100. Based on work by Wikivoyage users Traveler100bot, Andree.sk, Mx. Granger, AndreeBot, SelfieCity, Ground Zero, Ikan Kekek, Vidimian and AndreCarrotflower and others.